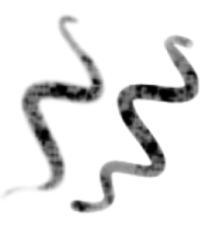 In Harmony, you can use the Brush tool to draw bitmap textured lines. In the Brush Tool Properties view, you will find a series of default textured "brushes", but you can also create and import your own custom collection. 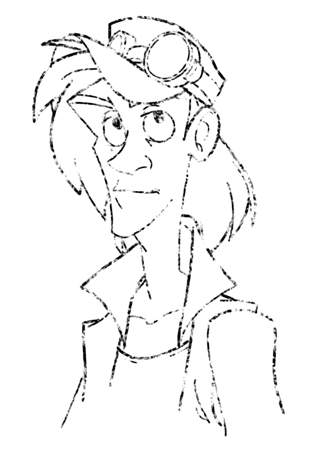 In Harmony, when using a textured brush on a vector layer, the texture of a brush is referred to as the Paper Texture. In other words, we are attributing the texture not to the tool, but to the texture of the surface that is revealed when a stroke passes over it. You will understand why when you work with bitmap brushes on bitmap layers, where it is possible to have both a textured brush tip and a paper texture. 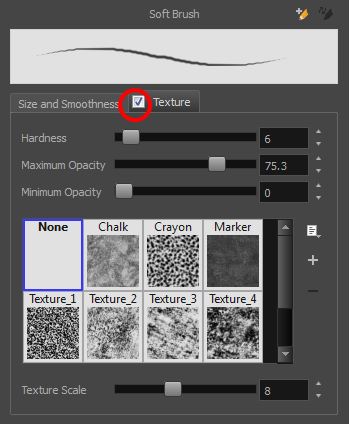 To create your own textured brush, you must prepare your texture file ahead of time, either in Harmony or in a third-party software, such as Adobe Photoshop. Colour is not supported and transparency is not supported in the traditional sense. Black appears as 100% opaque, white appears as 100% transparent, and all the shades of grey in between appear as varying degrees of semitransparenty. A range of file formats are supported—.jpeg, .png, .tif, .psd, .tga to name a few. Alpha channels are disregarded on import. It is recommended that you maintain the texture resolution between 100 x 100 pixels and 400 x 400 pixels. 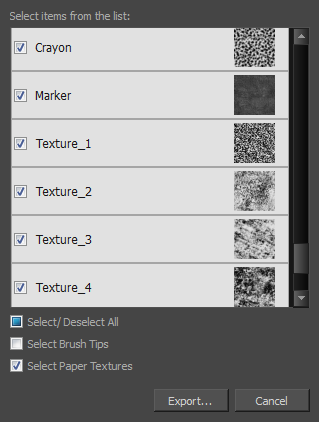 You can import your custom paper textures in the extended Brush Properties window. Browsing for a texture file with a brush selected that is already using a paper texture will replace the file currently in use. It will not, however, replace the texture in lines already drawn. 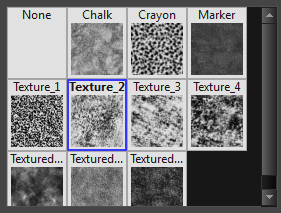 The replaced texture swatch will no longer be the selected texture, but it will remain in the texture library and not be deleted. Harmony also allows you to import textures as an .xml file that was exported from another project. In this way, you do not have to import individual image files one-by-one to have the same texture library and brush presets as others who you are collaborating with. You can also export brush presets and textures, in order to share your default or customized textures and presets with other project collaborators. When you use the Eraser tool to erase a portion of a textured line, the vector frame is cut straight and you lose the feather created while drawing with the Brush tool. 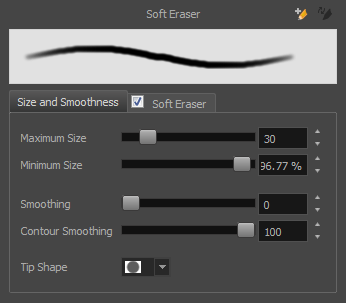 In Harmony, a special option in the Eraser Tool Properties lets you create a soft edge on your textured lines. You can also cut or keep the vector frame as is. At some point, you may want to modify the look of a textured drawing if you suddenly find that your lines look too hard or too light. 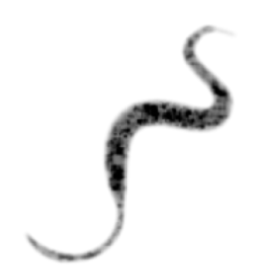 You can adjust those parameters by using the Adjust Line Texture Opacity command. In the Tool Properties view, select a brush and click the Arrow button to open the Brush Properties view. Click the Texture tab, select the Texture option. The hardness value corresponds to the softness of the line edge. The lower the value, the softer the line edge will be. The higher the value, the sharper the line edge will be. Maximum Opacity This value corresponds to the transparency of the stroke when the pressure is heavy. This value corresponds to the transparency of the stroke when the pressure is light and is a percentage of the Maximum Opacity value. Select a texture for your brush from the premade textures available. Adjust the Texture Scale to change the size of the texture in the lines you draw. If you are using a plaid texture, the squares will be larger if you increase the value and smaller if you decrease it. In the Drawing view, start drawing. ‣ From the Paper Texture menu , select Add. ‣ Click the Add Paper Texture button. In the Paper Texture library, select a texture. From the Paper Texture menu, select Rename. In the Rename Texture dialog box that appears, type in the new name for the texture. ‣ In the Paper Texture menu, select Delete. ‣ Click the Delete button. NOTE: You can delete any texture in the texture library as long as there is no brush preset using it. Small Thumbnail Reduces the size of the thumbnails in order to view more at the same time. Large Thumbnail Increases the size of the thumbnails in order to see the images more clearly. List View Allows you to see the name, as well as the thumbnail. 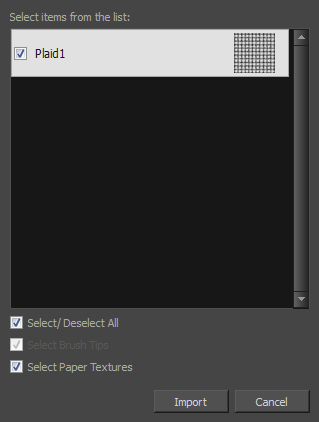 In the Paper Texture menu, select Import. In the Import Textures dialog box, select the paper textures that you wish to import. You can import any available brush tips at the same time too. The imported paper textures will appear in the Paper Texture Library. You can reuse any of the imported paper textures to create other brush style presets. In the Paper Texture menu, select Export. In the Export Tips and Textures window, scroll down the textures list to the paper textures and select or deselect any textures to create the list that you wish to export. You can export brush tips at the same time too. In the Export Textures window that appears, browse to a location where you would like to save the .xml file and give it a name. Contour Smoothness Optimizes the contour line smoothness of the line. This parameter smooths the contour of the line once it has been traced. The higher the value, the fewer control points will compose your line. Lets you select a tip shape—from round and square ones to star shaped. This option is disabled when using a textured brush. Hardness Defines the softness of the stroke edge. The lower the value, the softer the stroke edge will be. The higher the value, the sharper the stroke edge will be. Saturation Lets you adjust the softness of edge feathering. Works in conjunction with the Hardness, e.g. 100% Hardness will yield no results in saturation change. 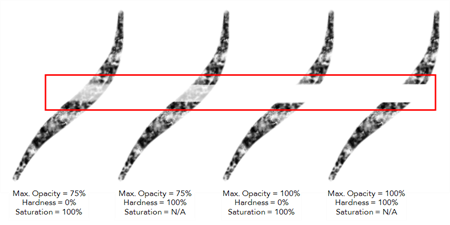 0% Hardness will allow a fine tuning of the feathering of the soft stroke edge. Maximum Opacity The transparency of the brush when the pressure is heavy. A smaller value will leave semi-transparent colour and texture. A larger value will ensure that everything is properly erased. This option in unavailable if the Keep Vectors option is disabled. Minimum Opacity Sets the minimum transparency of the brush, in relation to the Maximum Opacity, when the pressure is very light. A smaller value will leave semi-transparent colour and texture. A larger value will ensure that everything is properly erased. This option in unavailable if the Keep Vectors option is disabled. Keep Vectors Keeps the vector frames around your strokes intact, only the texture fill disappears. Disabling this option will cut the stroke's vector frame into different pieces when the Eraser tool passes over it. If you disable this option, the maximum and minimum opacity sliders are disabled as well. 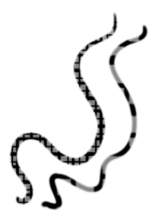 In the Drawing view, erase your textures lines. 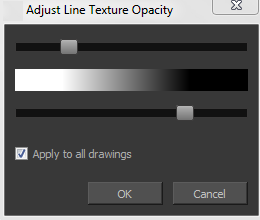 In the Drawing view menu, select Drawing > Adjust Line Texture Opacity. The Adjust Line Texture Opacity dialog box opens. Drag the sliders toward the middle to increase the contrast and opacity of the textured lines. If you want to apply the changes to all drawings exposed on the layer, select the Apply to All Drawings option and click OK.